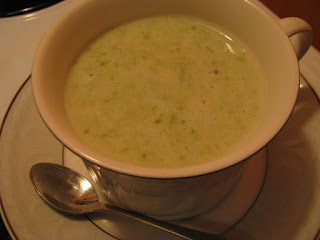 I only have a moment, but I made the most FABULOUS clean cream of asparagus soup yesterday, and I just had to share it! I used a VERY unhealthy chef-created recipe as a "flavour template", and went from there. To me, if it's a cream of whatever soup, it MUST be creamy, and MUST be flavourful I'm very picky about that kind of thing--I don't want to have a "light" version of some things, since the light version is most of the time NOT a good comparison. If it doesn't taste anything like the original, are you REALLY going to eat the healthier version instead of the original? I don't think so! Anyway, here's the cleaned up recipe. It turned out SO FLAVOURFUL and WONDERFUL! And you know if I say it's fantastic, then it is!! 1. Snap the asparagus spears at their natural separation point. Set aside the tops, and don’t throw away the bottoms. 2. In a medium pot, bring the stock to a boil. Add the woody lower stems, lower the heat to medium-low or low, cover and simmer for 20 minutes to release the asparagus flavour into the stock. Discard asparagus bottoms. 3. In another medium pot, heat olive oil and olive oil margarine over medium to medium-high heat. Add leeks and onions, and sauté until soft—about 5 minutes. Add garlic and sauté until fragrant—about 1 minute. Do not allow to brown. 4. Add leeks, onions and garlic to pot with stock. With an immersion blender, carefully blend until smooth (or relatively so…don’t go crazy trying to blend every last bit). 5. Add milk, Bragg’s Liquid Aminos, fresh ground pepper, nutritional yeast, and sea salt if using (taste before adding). 6. Chop the asparagus tops you set aside earlier, into small pieces, about ¼ inch thick. Add to soup pot. 7. Heat at medium-low heat, covered, and simmer for about 10 minutes, stirring frequently, or until asparagus is cooked. 8. With an immersion blender, blend to desired consistency. I like my asparagus soup to be only partly blended, with quite a few pieces of asparagus still in it. 9. Remove from heat, and pour into serving bowl, or individual bowls. Serve with crusty whole grain, if desired. Nutritional yeast is a source of protein and vitamins, especially the B-complex vitamins, and is a complete protein.